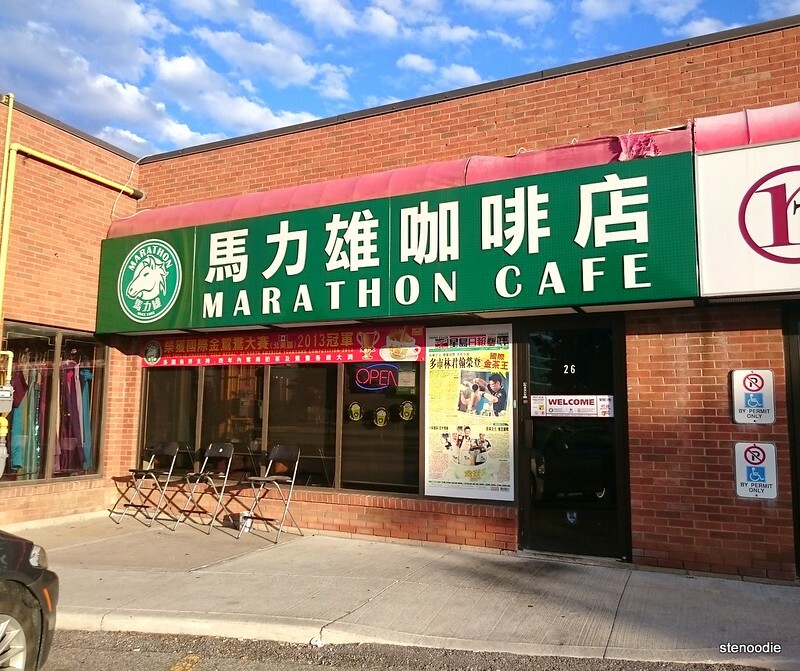 Before we left on our exciting Executive Council Extended Weekend trip, we all gathered at Marathon Cafe in Richmond Hill at 8 a.m. to have a hearty breakfast first. We were the first to walk in on a Sunday morning in this Hong Kong style cafe. 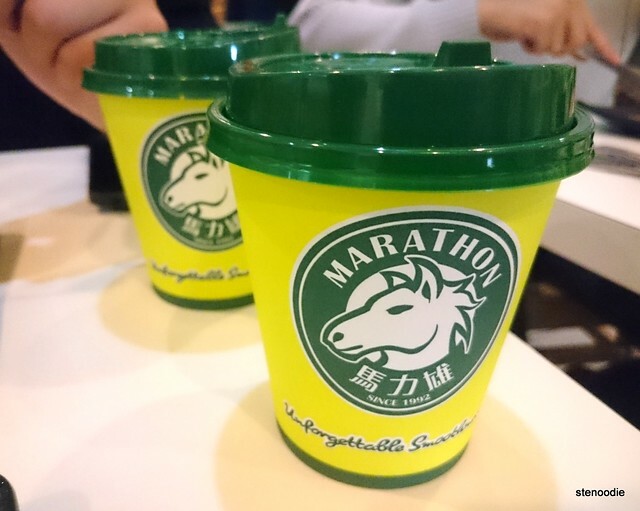 Marathon Cafe is famously known for their award-winning Hong Kong style milk tea. 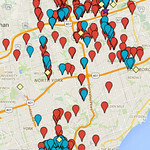 Their flagship shop is Marathon Donuts & Coffee Shop at their Midland and Finch location in Scarborough. This Richmond Hill shop is an extension of their first shop. Nevertheless, they still feature their award-winning milk teas and you can see the trophies on their mantle behind the counter. 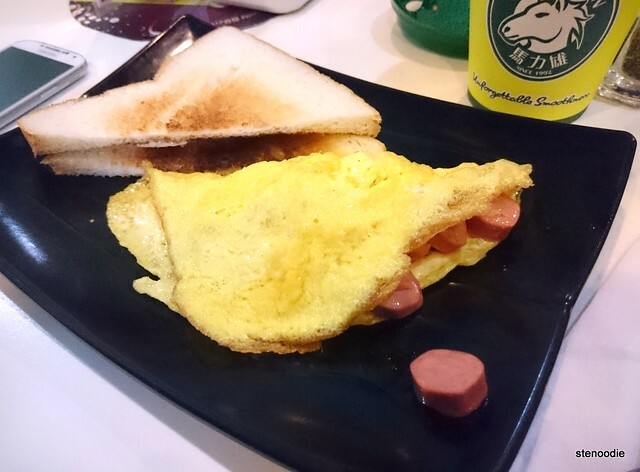 I ordered the Sausage Omelette from their all day breakfast menu. 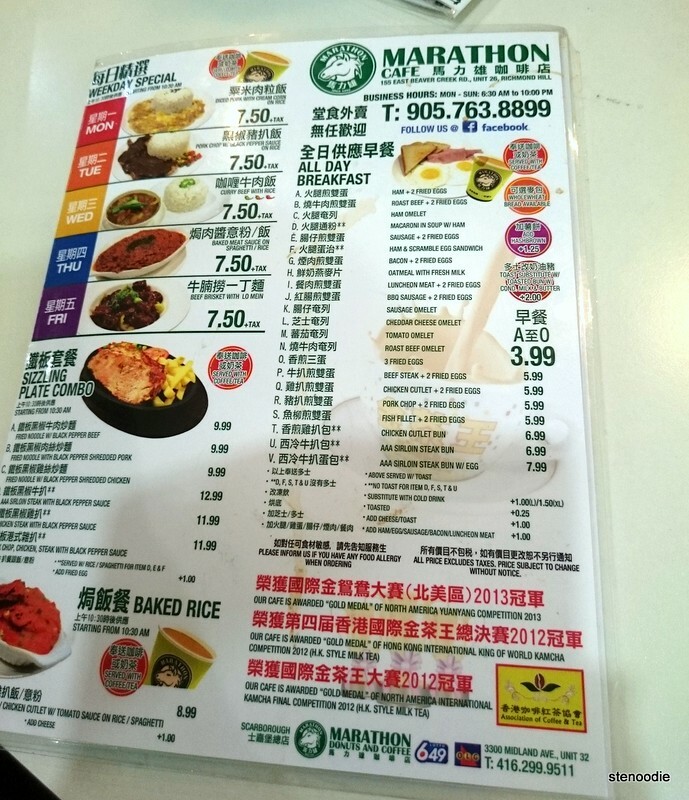 Each item on their menu includes a free coffee or milk tea. I am awfully sensitive to milk tea as it is like coffee to me — keeps me up all night and I can’t sleep. I knew that we were in for a lot of fun on our trip and I wanted to fall asleep easily and slumber deeply that night so I didn’t choose their infamous milk tea even though I really wanted to try it. I opted for a hot honey lemon tea instead. We placed our orders at the counter and paid and took a seat. Before long, they served us the food at the tables we were sitting at. Yum! Each order also includes a slice of buttered and slightly toasted toast. 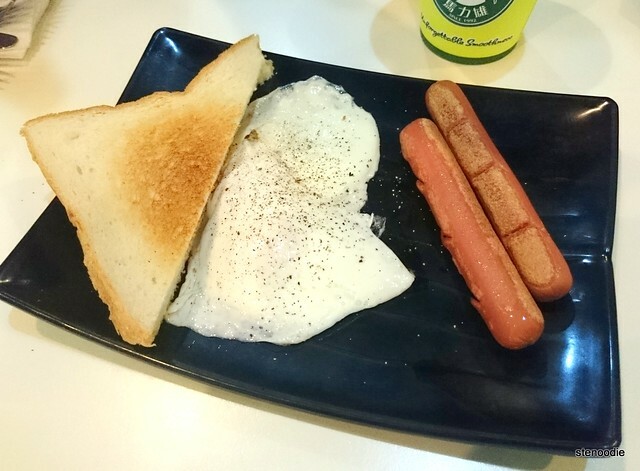 I really liked the breakfast since it was so simple. 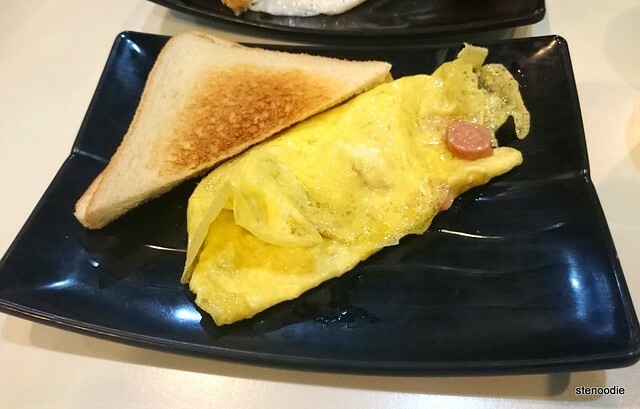 They used just regular sausages in the omelettes. However, I thought that the omelettes were too paper thin; I really enjoy runny and fluffy omelettes. 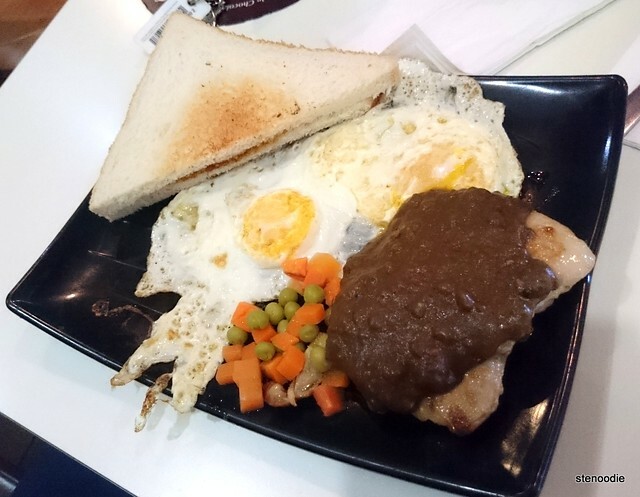 Nevertheless, it was still a great breakfast for less than $5. These are some pictures of what the others ordered. 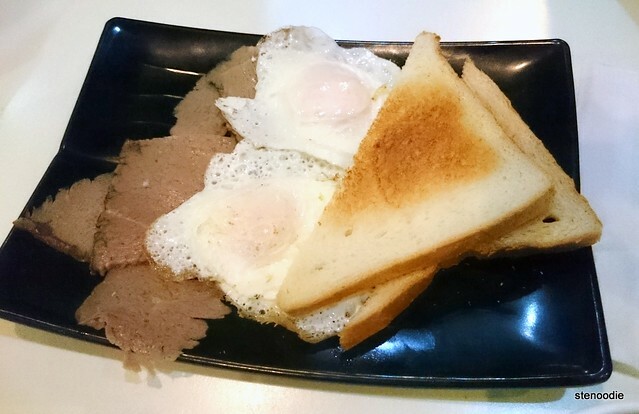 I tried a bit of the roast beef that Lawrence had in his breakfast set and I loved how smooth the slice of roast beef was. Yum! I also tried a sip of the infamous milk tea. It was incredibly smooth! 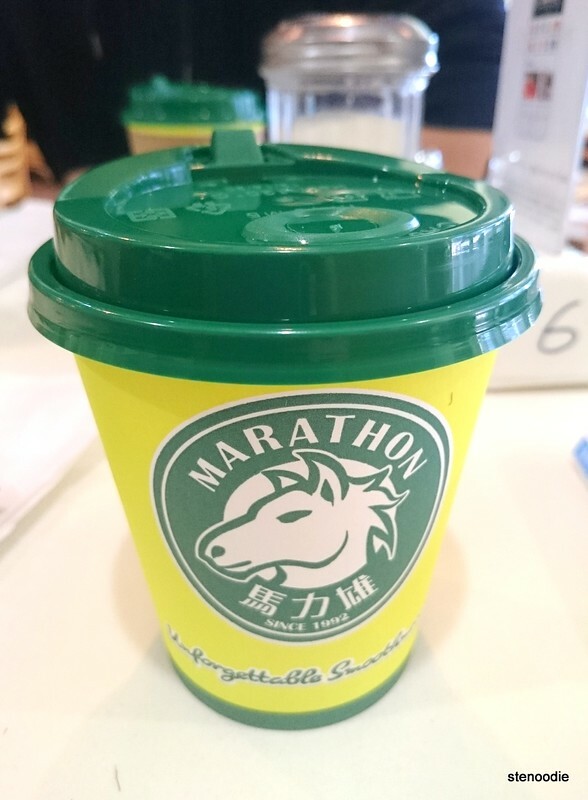 Forward to after the trip and a few of us found ourselves having breakfast at Marathon Cafe again. I wanted to try another item from their all day breakfast menu and their milk tea. 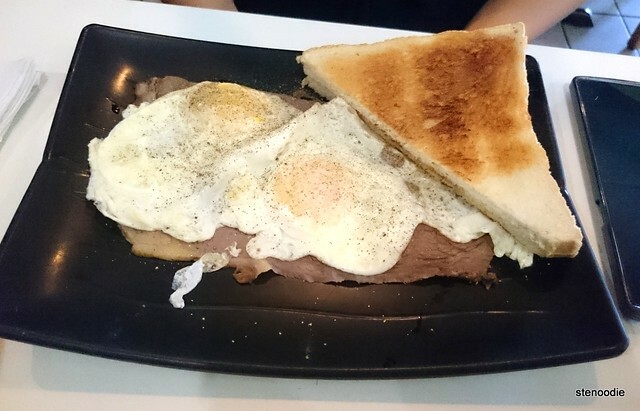 😀 On this visit, I chose the Roast Beef and Two Eggs combo and Milk Tea as the drink. I asked for the eggs to be scrambled (I love scrambled eggs!). 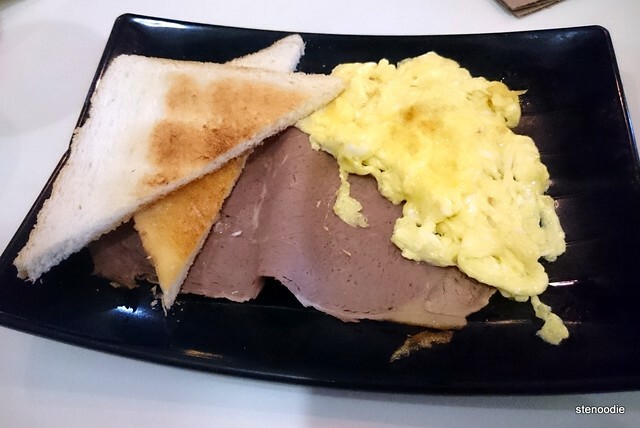 I really enjoyed the roast beef and scrambled eggs. The milk tea was very smooth and creamy. It was quite strong in tea flavour too. 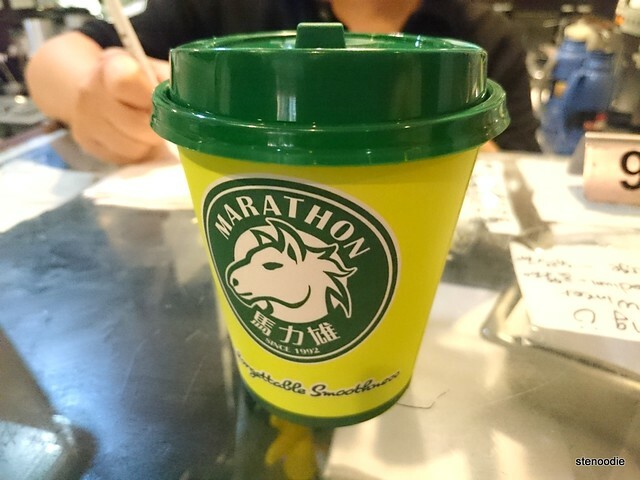 After finishing the cup, I found myself a little jittery too. 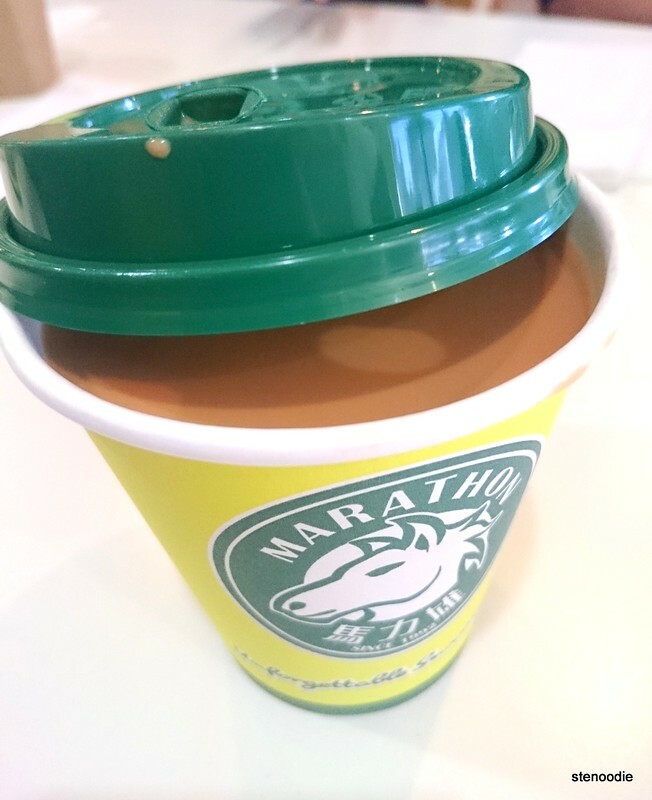 I am awfully sensitive to the caffeine in milk teas. Let’s see how well I can fall asleep tonight… if at all lol. 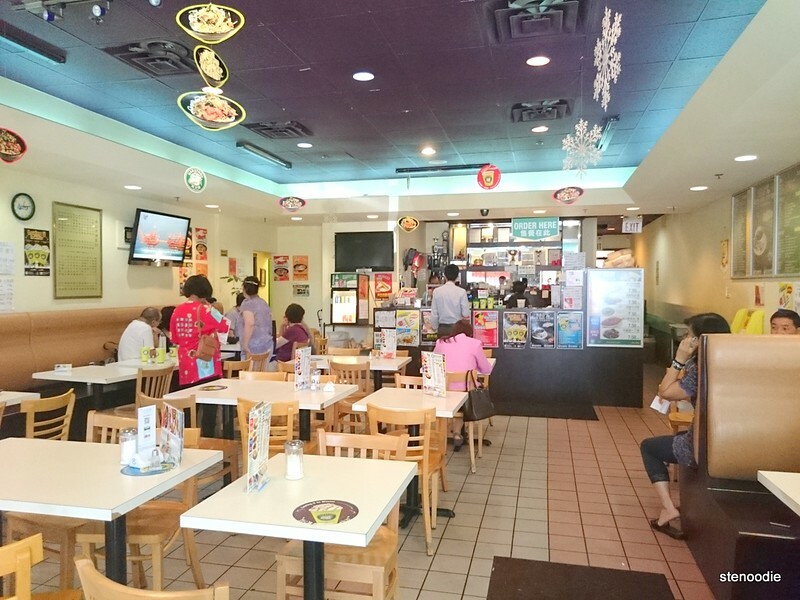 This entry was posted in Food and tagged 155 East Beaver Creek Road Unit 26, all day breakfast, award winning, best milk tea, breakfast, cafe, casual, 馬力雄烈治文山分店, food blog, foodie, free wifi, HK-style cafe, Marathon Cafe, milk tea, Pork Chop & Two Fried Eggs, restaurant review, Richmond Hill, Roast Beef, Roast Beef & Two Fried Eggs, Sausage & Two Fried Eggs, Sausage Omelette. Bookmark the permalink. Ya ya! This is amazing eh 😀 Maybe there are but it’s a hidden gem? Time to move to better living standards then? 🙂 Do some research. Love their HK style milk tea! It’s soooo smooth, creamy and soooo full of tea flavor (not water down at all). Wish I was back in TO right now! I agree! 🙂 On a side note, I didn’t have trouble falling asleep at all last night after having a full cup of their milk tea. However, I was fully awake until almost 3 am in the morning XD. 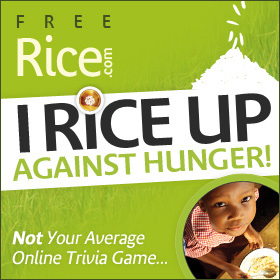 Where do you reside, Howard?